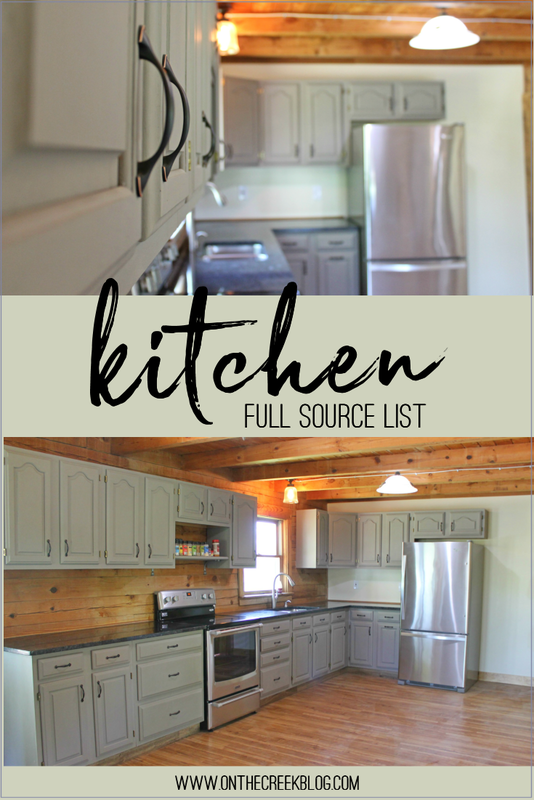 The full source list for everything in my kitchen! I’m also talking about how everything is holding up two+ years later! 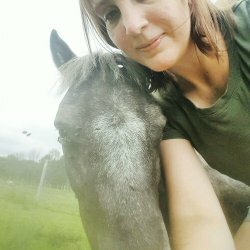 So…I guess this post has been two+ years in the making! Haha! 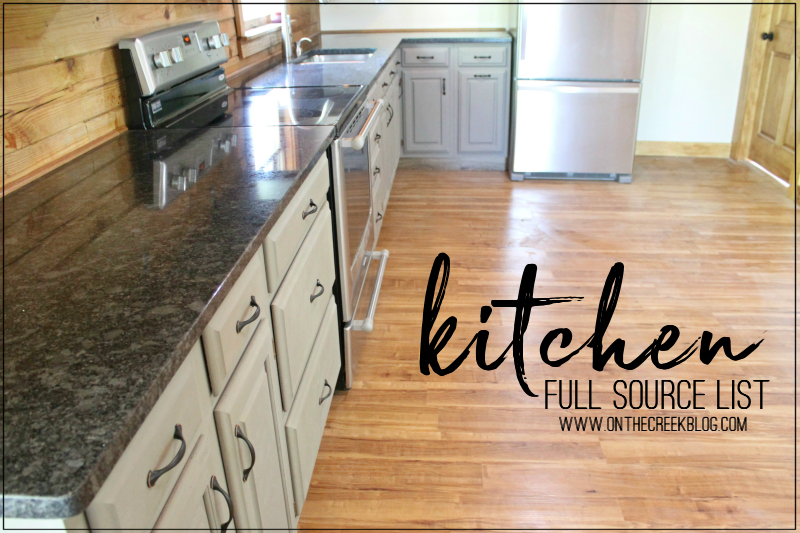 I shared my kitchen reveal almost two & a half years ago now & realized I never gave you the full details! At the time, I was just so excited to be DONE with our full house renovation! It took seven months of nonstop renovations to make our house a home again & after it was done, I really didn’t want to talk about it! Haha! But that’s changing today! As I’m gearing up to make more changes (hello new cabinet colors!) to our kitchen, I thought I’d give you the deets on where we got everything for our kitchen & how I feel about it now, 2 years later! Since this is probably going to be long winded, you can skip down to the full itemized list! 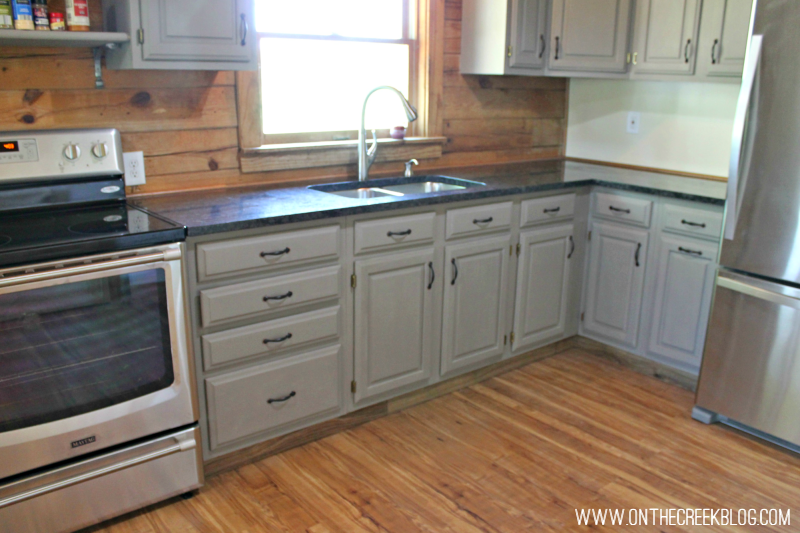 We bought our kitchen cabinets from our local Habitat For Humanity ReStore for about $200. We weren’t even planning on going into the store that day & made a last minute decision to stop by. Our ReStore almost never has full set kitchens & we totally lucked out with this one! 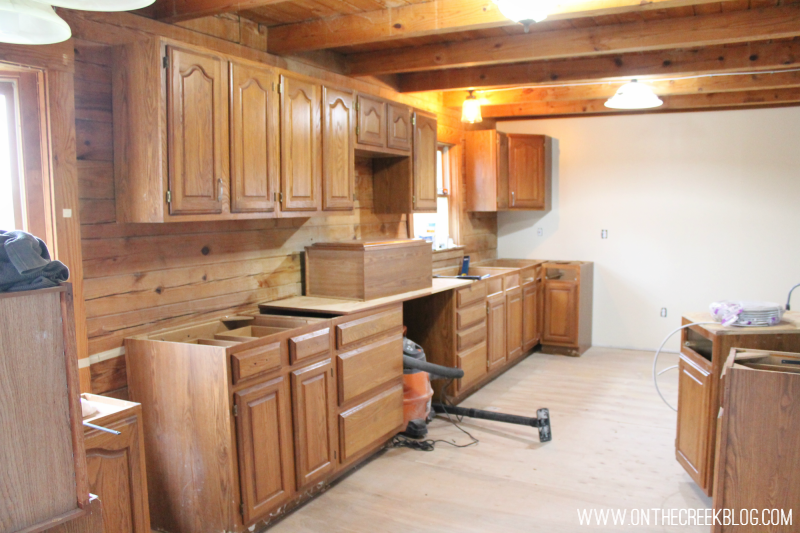 Of course, used kitchen cabinets have their disadvantages! My husband had to repair a lot of the cabinets & while the cabinet doors are solid, we realized later that the rest of the cabinets weren’t the best…but we just couldn’t pass up the price. If we weren’t in such a money pinch at the time, we probably would have explored a bit more, but we totally made these work! I knew I wanted to paint our cabinets from the very beginning. I also knew I wanted to use Annie Sloan Chalk Paint®. I didn’t have a particular color in mind, so I just kind of chose one when we were there! I didn’t even buy test colors! I just committed to “French Linen” & bought two large cans! I still really love the color, but I’m itching to do something a little different. 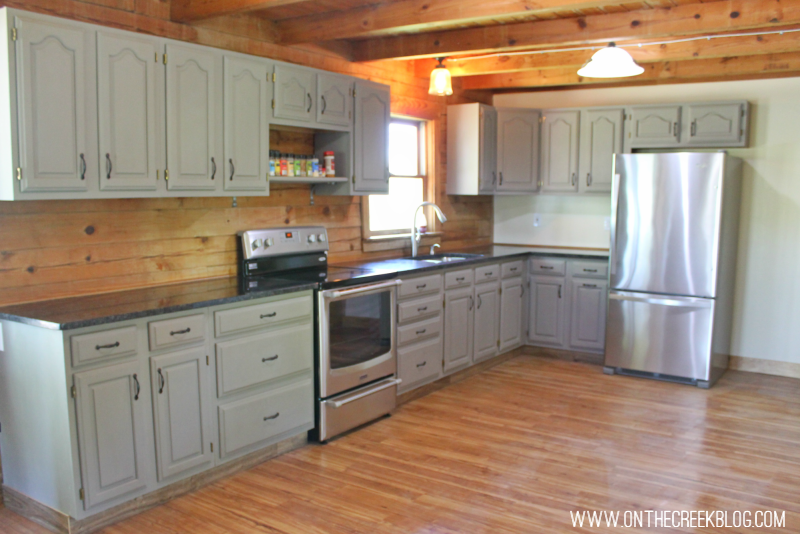 Painting cabinets is such a pain for me, though, so they might just end up staying that color forever! I wish I would have done a better job painting & waxing because the paint didn’t really hold up. It was totally my fault, though, & nothing to do with the actual paint & wax! We chose granite countertops. Personally, I think granite is a good middle of the road choice. It’s a step up from plain countertops & it’s not quite as expensive as my dream countertops (quartz). 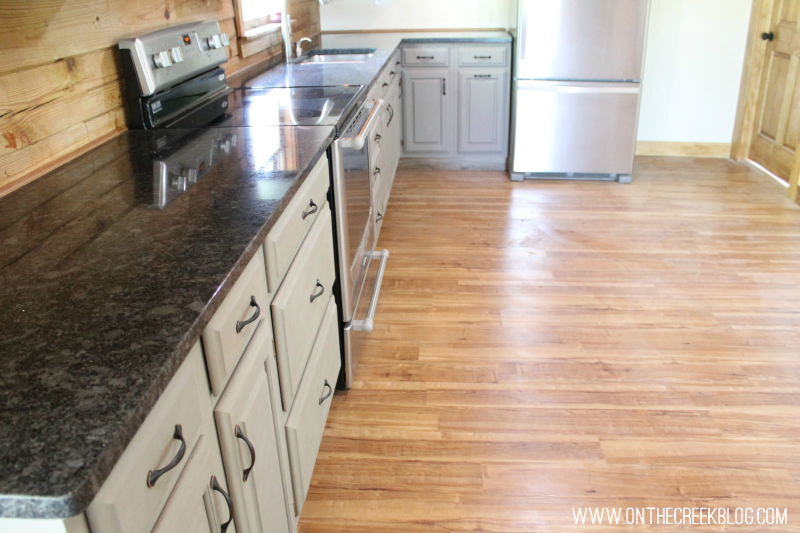 As someone who lived with the plain laminate countertops for nine years before this, granite was quite the step up! The only thing I don’t like about our counters is that I managed to put a few chips in the granite already! For the most part though, I love that I don’t have to be really careful with it & that it looks expensive. We actually just chose the cheapest granite option that Home Depot had. The price included installation & since it was our first time working with granite, we chose that option so we didn’t have to worry about it. The company supplying the countertop even offered to have us look at the actual stone before installation because granite sometimes isn’t the most cohesive. Since our schedules were super busy at the time, my husband ended up calling them to inquire & they said we chose a color that was fairly cohesive, so we didn’t have to view it beforehand if we chose not to. We ended up not looking at it before installation & it turned out great! 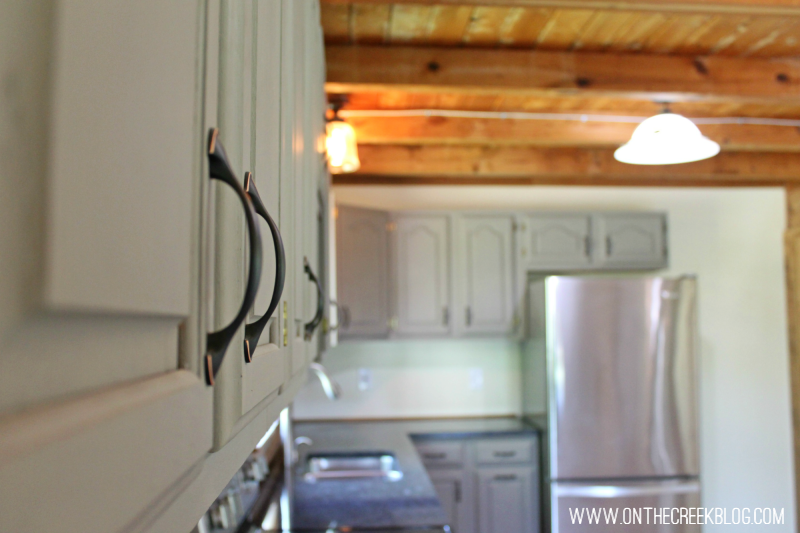 One of my absolute pet peeves is cabinets without pulls! It drives me crazy! I knew I needed pulls & lucky for us, our used cabinets already had pulls, so the holes were already drilled! That also meant that I had to choose pulls instead of knobs for the upper cabinets, which was fine by me. I just chose the fanciest looking value pack from Home Depot! They’re super cheap & look great! I might change them out in the future, but for now, I’m still liking them! 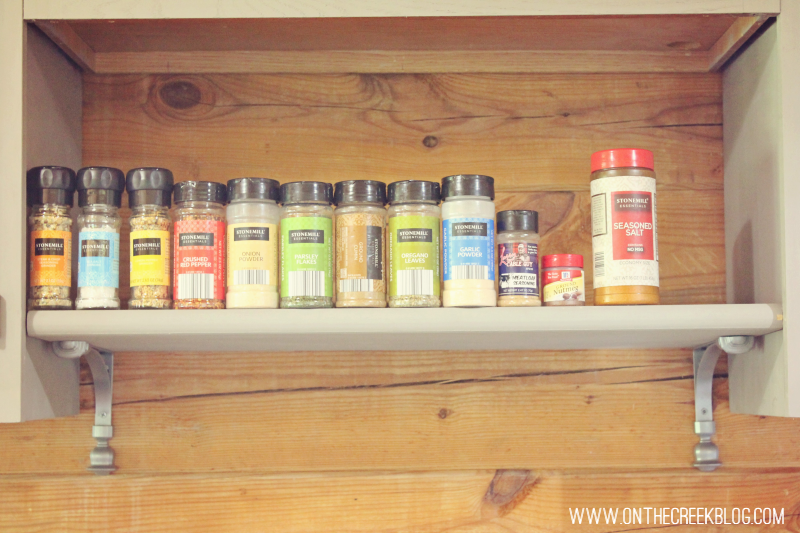 We made a super easy spice shelf above the oven using a stair tread! It’s one of my favorite things because my spices are always within reach when I’m cooking! Here’s another fun one! We never actually looked at our sink before it was put in! It was bundled in as part of our granite installation. Home Depot might have had a similar sink that we saw, but we never really viewed it until installation. We just chose a simple stainless sink, so there wasn’t really much to look at anyway! 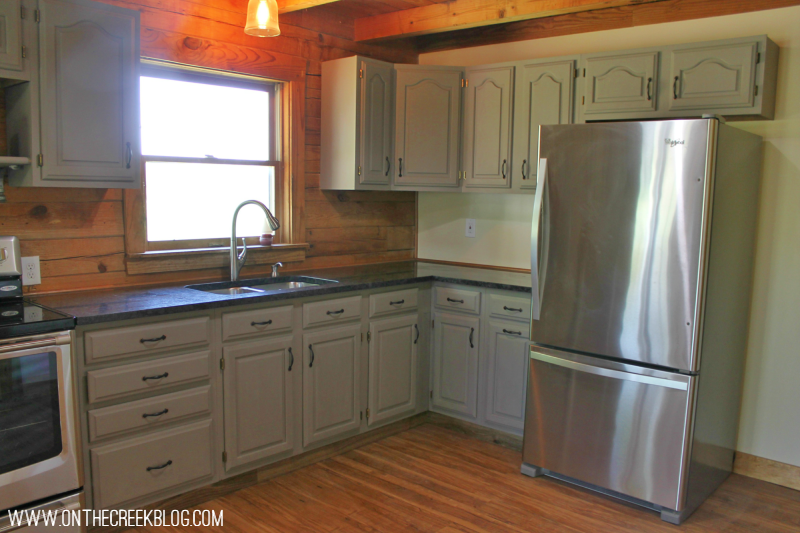 I would have liked to do a farmhouse sink, but our cabinets weren’t set up that way & I wanted the little pop out cabinets under the sink anyway! Since we don’t have a dishwasher, I wanted the sink to be 2 compartments & deep! It’s worked out really good so far! I knew I wanted a pull down sprayer type faucet & a soap dispenser! We chose a color that would match our sink. The company that installed our granite drilled the holes for our faucet & installed it. I think we might have had to connect it to the plumbing? They actually told me husband that most people don’t install the soap dispenser & it just breaks fairly early on anyway, so I was concerned about that, but it’s still holding strong! I’m also not super aggressive with it. It is a complete pain to refill because you have to reach though the entire bottom cabinet, but I think it’s well worth it! Our soap consumption have gone down tremendously! We can go months before refilling it & that’s with using it every single day! I love the pull down sprayer too! 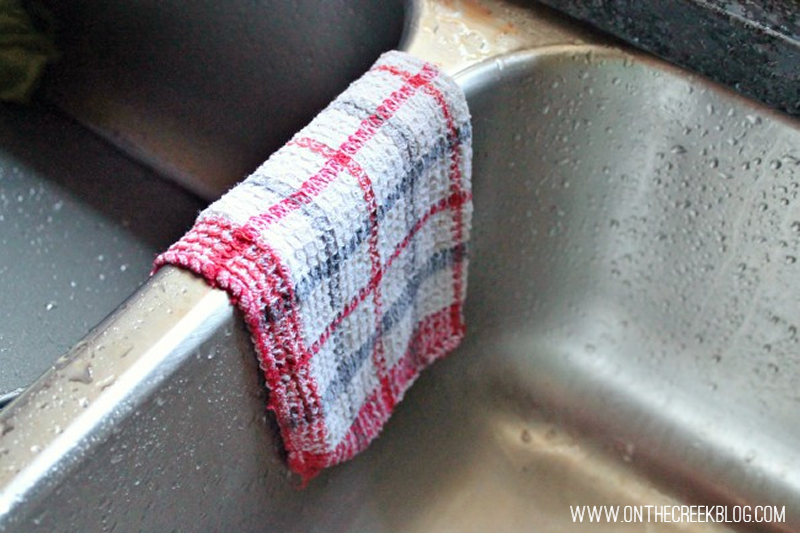 It makes washing so much easier! You can also switch the water from spray to stream & I love that! 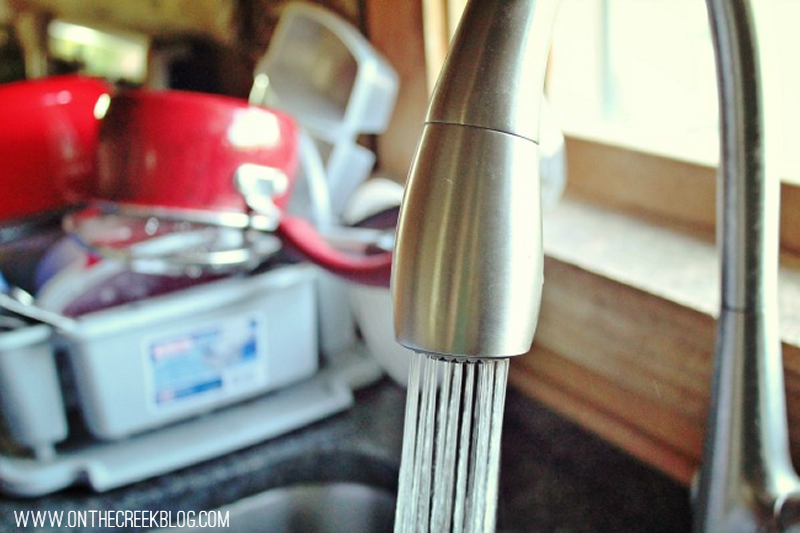 I think it’s so awesome that everything is done on one faucet! We chose stainless appliances. We kind of splurged a little with the refrigerator, but it wasn’t the most expensive option. We chose a middle grade oven. I was super adamant about getting one with a warming burner & ours has it. Also…I haven’t used it once! The oven does also have convection cooking, which I love! After cooking on a hand me down oven for nine years, I was super excited to use new stuff! We chose the same flooring for the entire house. It was a moderately expensive waterproof type flooring from Traffic Master. It’s discontinued now. I knew I wanted to go with waterproof flooring because we have animals & also because I hate carpet! My hatred for carpet goes deep, so we have zero carpet in this house! We did end up purchasing some large rugs & remnants, but nothing is attached to the floor! Now, this flooring. I hate it! It’s supposed to be scratch resistant & there’s already millions of scratches in it. It’s also a pain to clean! It might be the light color or something, but it just doesn’t stay clean at all! The best way to clean it is to hand scrub the entire thing, which is a pain. I purchased an expensive floor cleaner & that seems to do a good job too, but it’s just not one of those floors that can just be mopped & look good. We have a ton of rugs down so you really can’t see the floor, which makes it look cleaner because I only have to clean a fraction of it! I think that covers all of it! Almost 1,500 words later!